marshmallow decorations | The difference is in the detail. 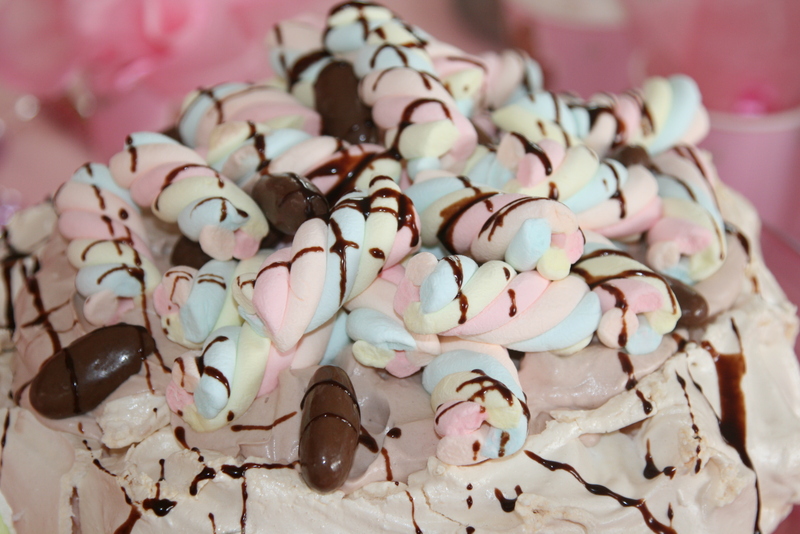 Today’s post is following a comment from a reader about using marshmallows in stead of frosting for the Barbie cake (see Barbie birthday post). So, I promised to show a little more from another occassion. 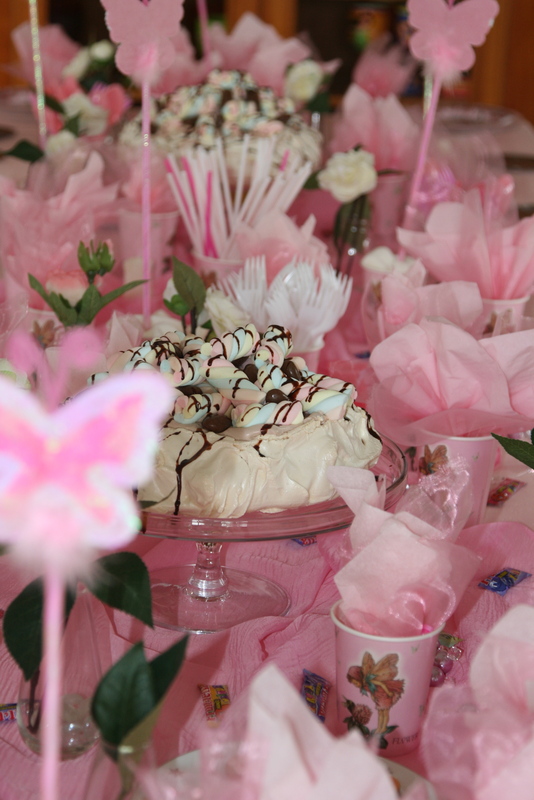 I love using marshmallows for a party where you need fluff and flair and dreamy feelings ! 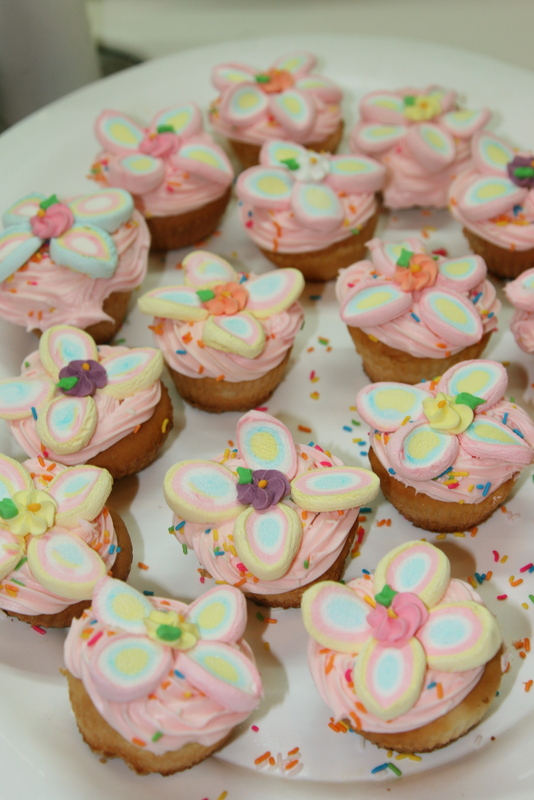 At my youngest daughter’s Fairy birthday party, I used marshmallows for the decoration of the cupcakes. But it worked its’ charm just as perfect on the grownups’ pavlova ! 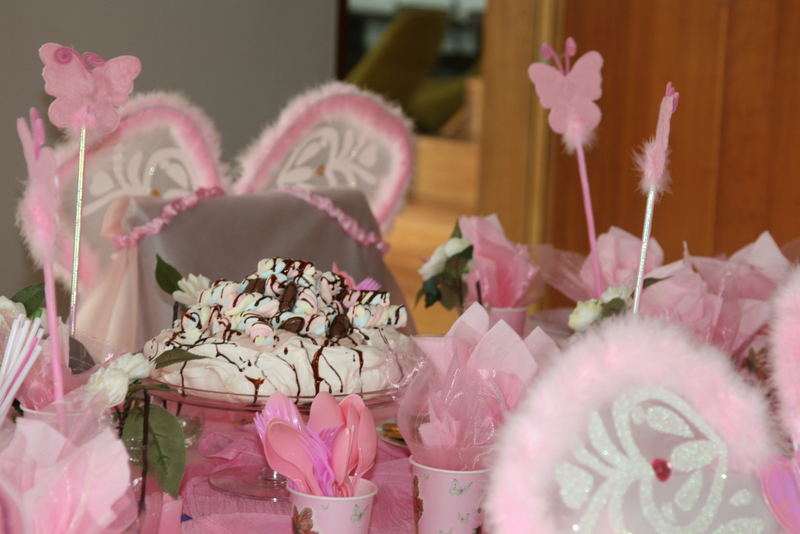 All you really need to get the fairy flair in the party, is fairy napkins, fairy cups and plates, fairy goody bags and of course – a pair of fairy wings for every little person that come join the fun ! …oh….and I almost forgot ! Lots and lots of fairy colours – which most girls would say is PINK !!!! I just bought these goody bags at a local grocery store…but another idea is to take a piece of netting and cut up squares and fold and tie them for a goody bag. 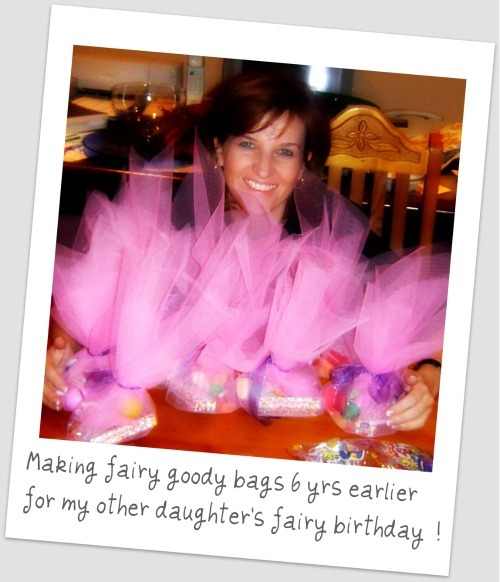 This is what I did for my other daughter’s fairy birthday when she was the same age. 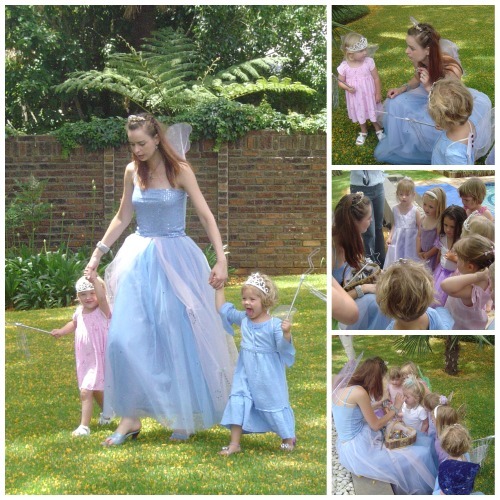 At that birthday, 6 years ago, we rented a “BIG FAIRY” – co-worker who rented her services out as pretending to be the Fairy Godmother who visited all the fairy parties ! The kids were mesmerized and it was a great entertainment idea for a fairy birthday, but unfortunately we did not have it this time ! I used all the spare fabric I had to fluff up the table in pink….napkins, window bead-strings and fairy wands to get them completey carried away in the pinkness of fairyland ! With colour or themed parties – when you want to make big impact….draw the attention ALL to one table or one spot, and make sure in that specific area you see NOTHING but that which is intentionally there for the party ! It is already difficult to transform a room into a party room with all your regular things competing with your party decor. So, best to contain your efforts to one area! 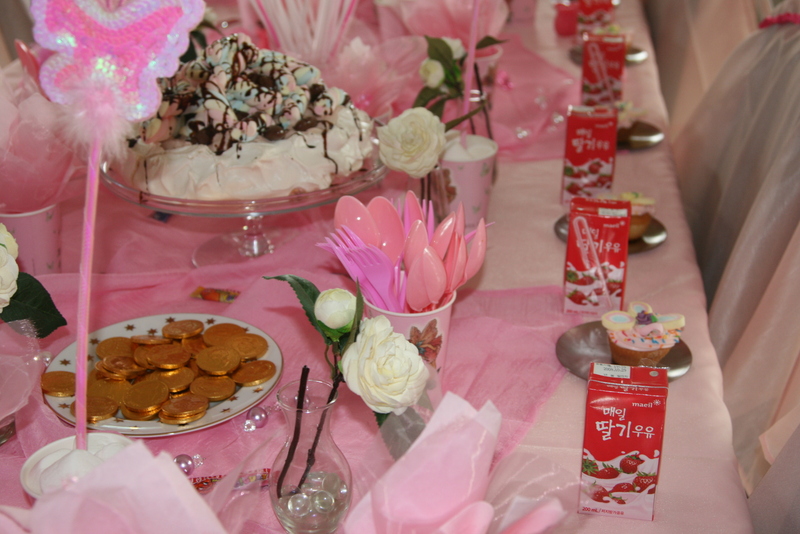 And when you go for pink, then we really mean pink – no orange drinks would be allowed at THIS party ! 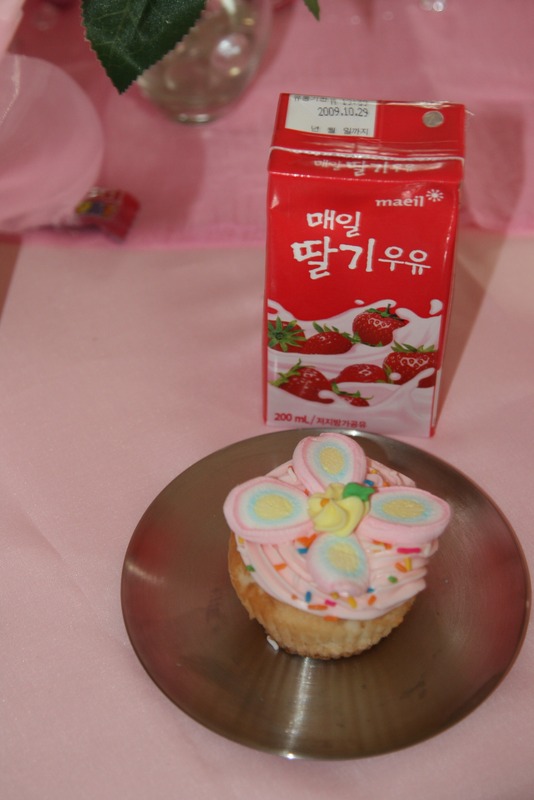 You can go for guava, strawberry or any pink drink…but for our little fairies we chose a pink milk to go down with the cupcake! To avoid the mad rush when you bring the cupcake tray..put their cupcakes already in their places where they will stand around the table… Call it “crowd control”, if you will…but at least it helps kids to very quickly spread out if there is already a cupcake as a place-marker ! I used candle-trays for little plates. Cupcakes are a really nice alternative nowadays in stead of cutting up a big cake, since you can determine the number of portions a lot more accurate than with a traditional cake. 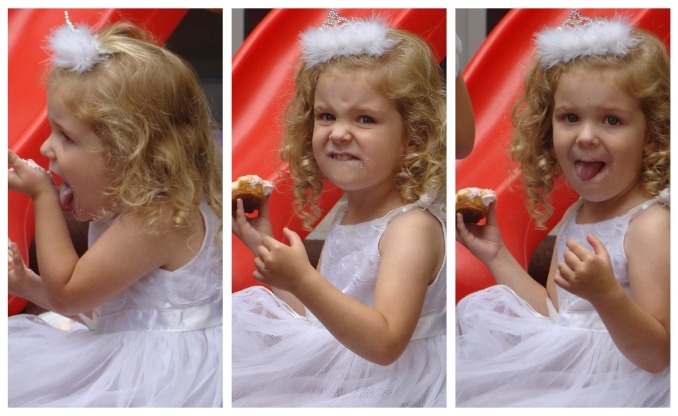 But, even when serving cupcakes I always try to have a small cake – just for the purpose of the candle-blowing. 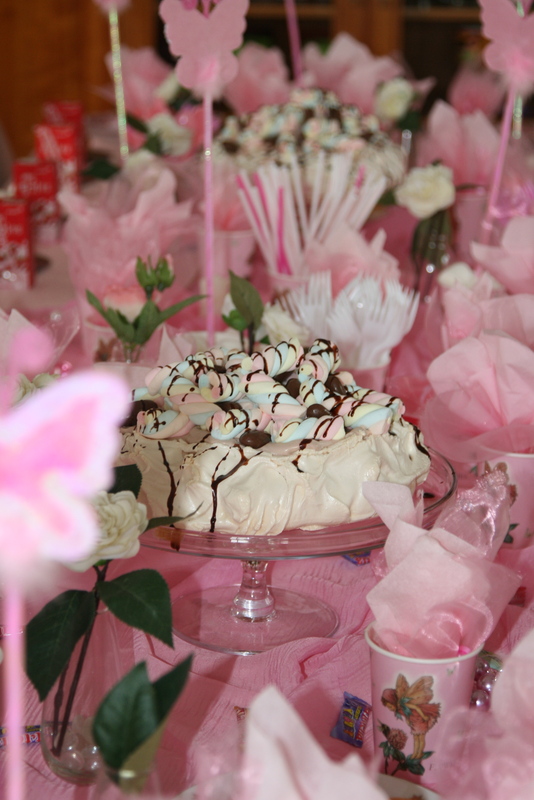 And for sentimental value – we used the same “cake decoration” that big sister had 6 years before on her birthday cake ! They were not edible…no, they were ceramic dolls and are now part of her room decor – and that’s why we could re-use them after 6 years !! 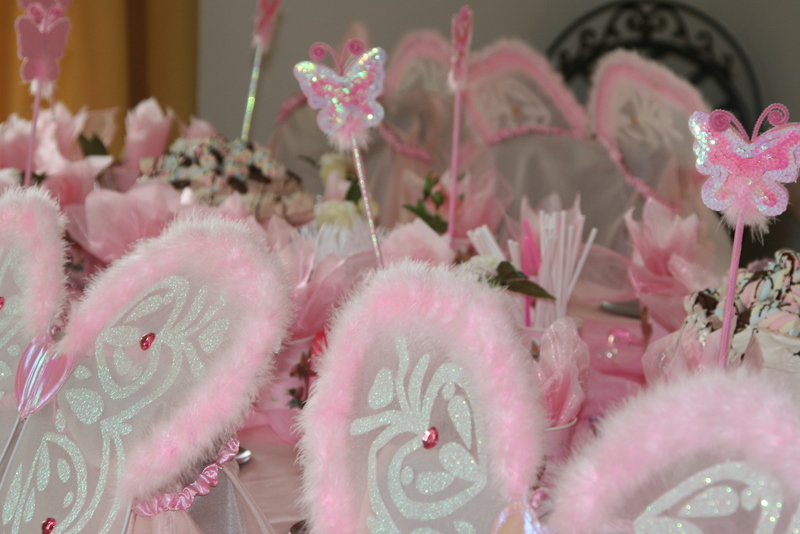 Another tip I think is handy to have, is that you can use your cups, napkins, utensils, and party favors ( in this case fairy wings & fairy wands), as part of your decorations. By doing this, the table looks fabulous when you start..but by the end of the party, it is all being “used” which means you have practically cleared the table. And why spend extra on decorations if you can use things that you will already have handy for the party. Back to my point of so many times before – combine form with function !! The time of year when this party was hosted, is warm enough for outdoor play, but it was not long after winter, which means the garden was not in great shape….but, hey – don’t let that ever stop you – if you can’t get a fairy garden…you just have to create you own…. 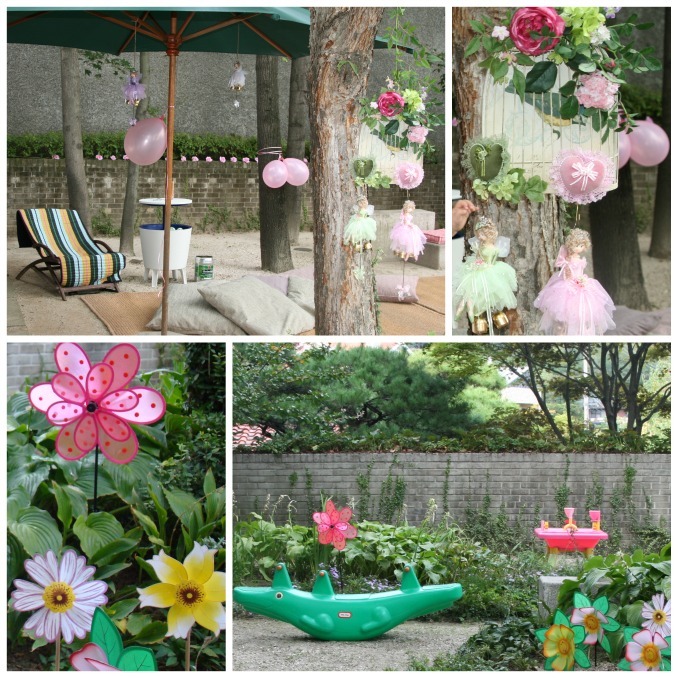 Again – lots of pink, hanging fairies and fake flowers to cheer things up ! Tip – we don’t normally have a pink house in the backyard…and did not buy one specially for the birthday…but in Korea, you can rent toys for 1-3 month period. 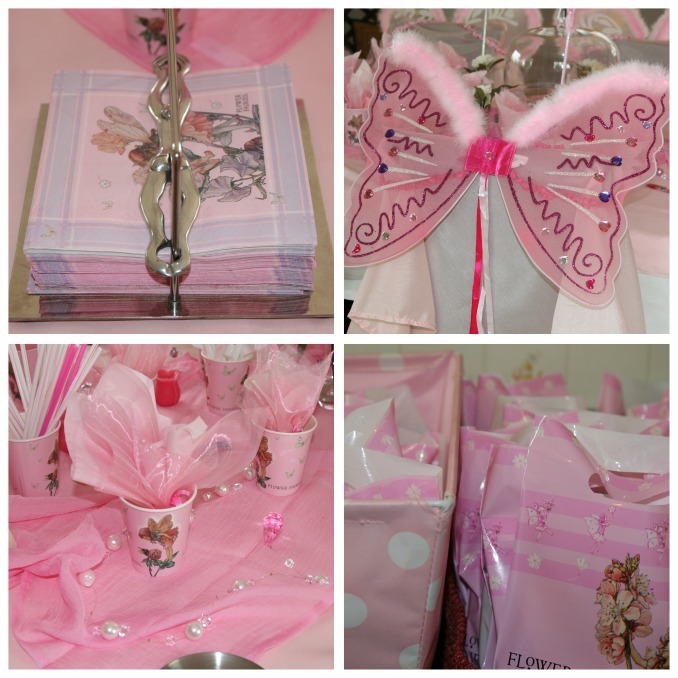 It costs a lot less than party entertainment or buying the big items….but it provided way more fun – not only during the party but also for the 2 months after – it just became part of the overall gift, since it was delivered the day before the party and it was a big hit with the party girl !! you can rent toys like the crocodile and the playhouse, from the following places – www.etoyworld.net , www.toyuncle.co.kr or www.babychild.co.kr. 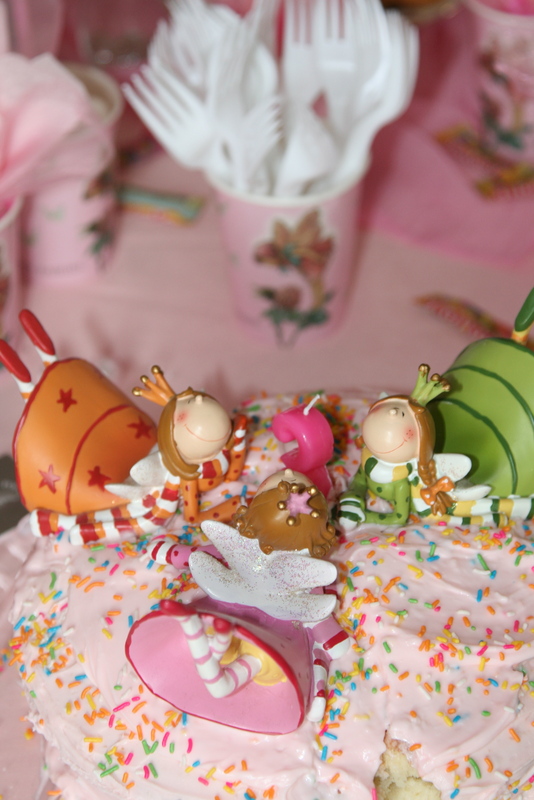 But at the end of the day – if you are the head fairy for the day – you get to have your cake AND eat it !